Mermaid Theatre of Nova Scotia’s vital educational outreach program entitled Theatre Beyond Classrooms, enables children enrolled in elementary schools, home-school groups, and daycares within walking or commuting distance to attend non-public dedicated matinee performances. The program encourages appreciation for the performing arts at a young age and strives to promote literacy and learning outside the traditional classroom environment. Our programming promotes the excitement of reading, supports analytical thinking and reinforces a positive communal and cultural experience. 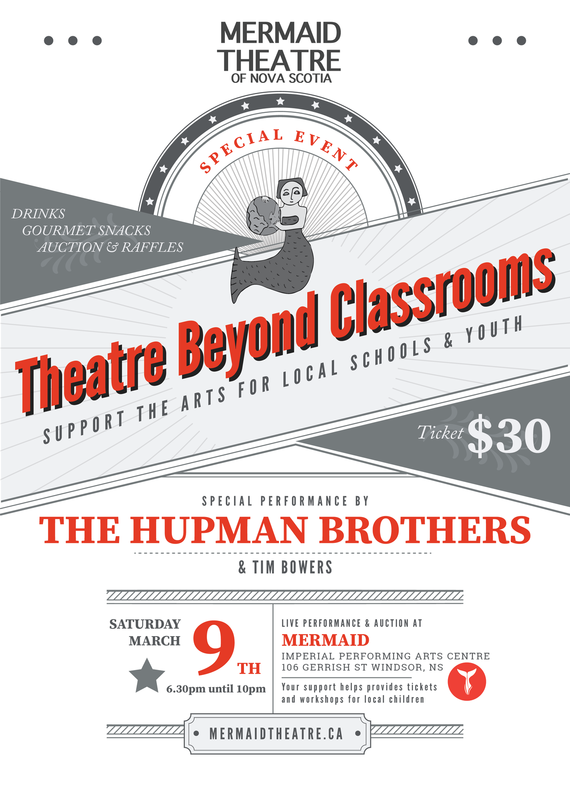 Join us for an informal and entertaining evening at Mermaid Imperial Performing Arts Centre which will feature live music, local beer from Schoolhouse Brewery, Nova Scotia wine, Annapolis Cider Company, snacks, pledge table, silent and live auction, 50/50 raffle.